The basket came in great shape. Very cute. I love it. Good price at OS. 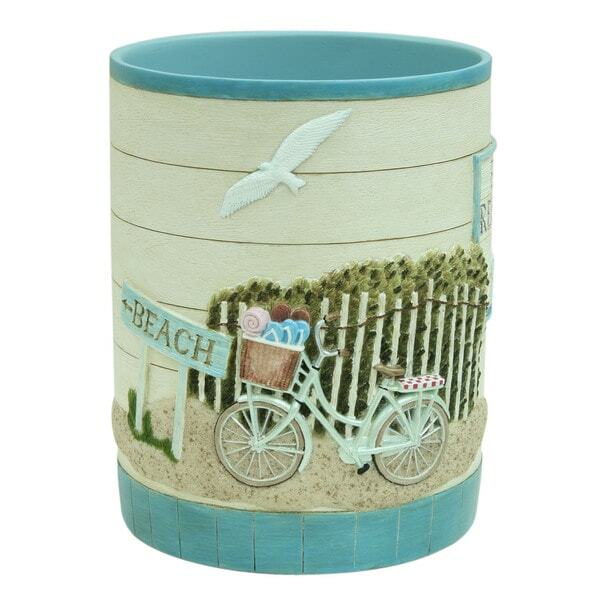 Include this beach cruiser coastal-themed waste basket when accessorizing your nautically themed bathroom decor. The hand-painted, carved resin waste basket matches other coastal-patterned bathroom accessories to provide a consistent decor theme. I like the quality of this Beach cruiser waste basket, as with the other accessories, it matches great and the value was hard to beat, as well as, collecting the rewards, well worth it! So fun and whimsical! Love the bicycle decor. I had already purchased the towels so had to find the rest of the items. This waste basket was hard to find. But Overstock had it and it was on sale too!! This line is so cute. Just perfect for my coastal florida home. Colors are just like the monitor. Worth the cost! I also bought the shower curtain, towels, Kleenex holder toothbrush holder, curtain holders. All extremely great quality. Overstock had the best prices, I checked:) a total buy. This is so cute and very sturdy. I recommend this basket. This just arrived &amp; it's too cute to use for garbage! I put it by the commode &amp; put two extra rolls of toilet paper in it &amp; am going to add a couple of magazines too. It's really cute - just love the whole collection! whimsical little trash talker. I feel like I have a piece of art in my room. In the summer, tall cut sun flowers and other branches make for a lovely outdoor focal point at the poolside. The perfect piece to finish my collection in my master bath..great quality..
Top 5 Bath Accessories to Create an At-Home Spa from Overstock.com. Any bathroom can feel like a day spa with the righ accessories. Here are five bath accessories to help you create that feeling.